Have you had your property damaged by the wind or falling debris? Here's what you need to know about your insurance. 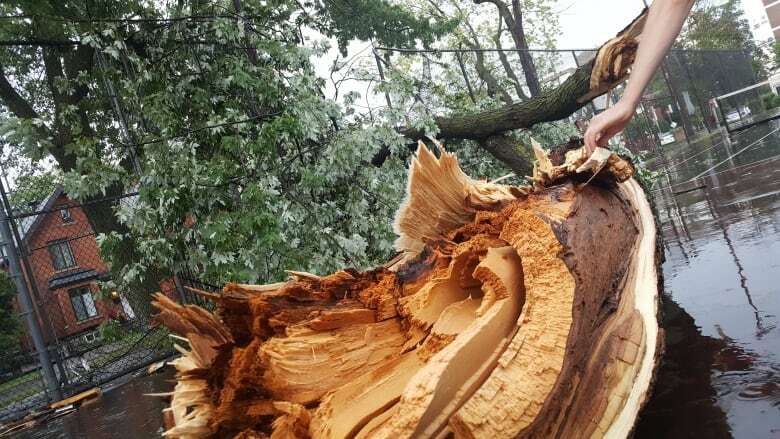 Ferocious storms and powerful winds have battered the Ottawa area this summer, leaving many homeowners wondering who to call when trying to determine how best to fix a fallen a tree. Here are some answers to questions you may be asking after a storm hits where you live. Generally, home insurance includes damage sustained during a natural disaster like a storm or flood. If a tree falls into your house, you're probably covered. However, if it is determined the tree was damaged or unhealthy before the storm, you may not be. If your insurance company concludes the tree was ready to fall, they often won't pay. The Insurance Bureau of Canada recommends calling your provider to confirm what is included in your policy and what might exclude you from aid. If a tree falls but doesn't damage any of your property, your insurance usually won't cover that. It will likely be your responsibility to call an arborist to remove the tree. Who do you call if a tree is about to fall? Before a major storm, it's a good idea to check the trees surrounding your property to make sure they're healthy. If you have questions or concerns, you can call the city to ask for an inspection. Keep in mind you need to get permission from the municipality before chopping off branches from large trees. If you're worried about your neighbour's tree falling on your property, you can ask the city to look at the tree or get permission to trim the branches back so they don't cross your property lines. Hydro Ottawa also prunes trees if they determine they are likely to interfere with power lines. They trim about 60,000 trees they anticipate could be a safety hazard each year. Who do you call if a tree falls? If fallen trees have injured someone, the first step is to call emergency services. After a storm has passed, if your house has been struck, you must determine who owns the tree. If it was on city property, call bylaw. If it belongs to you or a neighbour, call a private company to remove it. Once the danger is removed, call your insurance company to file a claim. Make sure to take pictures of the damage. Should trees block public roads, call the city immediately. If you notice a tree has fallen into a power line, keep your distance and call Hydro Ottawa. Tornado damages 6 homes in Mont-Laurier, Que.